Avast being an antivirus leader, did not receive the fame it needed in the VPN industry but as the name depicts it has a fan base and an edge over other VPNs for being an excellent security software company. Its antivirus users are 100% satisfied with its performance and have appreciated its new product line to the Avast family. 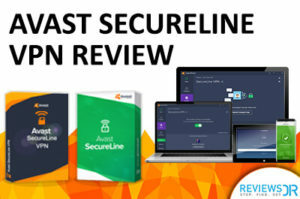 Then again, many question its credibility and authenticity as a VPN, which is why ReviewsDir after critically tested the Avast Secureline VPN, brings you a detailed Avast Secureline VPN review. What Does Avast VPN Do and Why Should You Use It? Avast VPN is the right step towards acquiring the utmost privacy and security online, no matter where you are; using Avast Secureline, remain carefree from employers, governments, snoopers, advertisers or any ISP trying to pin down your online activities. Click a button and your all online activities are safe and encrypted. Imagine your favorite coffee shop, where you find threatening to connect to its free Wi-Fi, thanks to Avast Secureline fast bank-grade high encryption, it tunnels all the content and data being surfed creating a safe haven with no cyber snooping. Being not well-known VPN service, Avast Secureline provides what its competitors do without any complications. It’s a top service provider with premium functionalities. We would request you to don’t judge the service by its demand, but the number of features, it provides. Scroll down and find the way you should use Avast Secureline VPN. Without the internet, surviving in this era seems cruel and close to impossible. Your life, your routine and everything connected is interrelated to the internet itself. Take that out, and you’ll lose everything, it’s a simple math. But that doesn’t mean the internet is all gloomy and a life saver. There are ways in which just being connected to the internet could ruin your life in a matter of a few clicks. Every year many cases emerge in the US regarding users’ logs and data losses where ISPs track and target netizens and their online activities. With Avast VPN, users can change this dilemma and be in charge of who wants to see their online activities. All of your online sessions will be kept anonymous and hidden unless you are using Avast Secureline, what else? You are safe from unwanted cyber criminals and dedicated agencies that are there to track or snoop your browsings. The primary purpose of any VPN provider is to provide you a secured tunnel to take you in the world of restricted content which is not available in your region. Users understand and feel the agony when they can’t watch their favorite shows live online or have the ability to download it on their devices. There are to date hundreds of VoD made available on the internet but only for those who are physically or virtually locating in the respective regions. In simple terms these channels are geo-restricted. Having an Avast Secureline VPN means the accessibility of all the regional-based content surfing via several servers locating in different countries across the globe; connect to any and beat geo-restriction like a pro. Do you want HD streams with no caps on bandwidth? Avast Secureline is all you need. Is Avast Secureline Torrent-friendly? Yes, It’s. What’s more fascinating that torrent downloads, thanks to Avast Secureline license to download fast and encrypted torrents. Many VPN providers claim to provide peer to peer connection through their data center locations but fail to live up to their promises. With Avast Secureline it’s different. This VPN provider has its data center locations listed in the following cities making it easier for the users to establish a good strong connection. Since it’s not a big name in the market such as NordVPN or ExpressVPN. Avast VPN has only 55 servers across 33 countries. The servers are stable and working due to its constant updates and bug fixes to ensure that users get the most out of the limited servers the VPN provider provides. It’s safe to know that Canada, Russia, and the US are the only countries where more than one server exists. We would suggest not to judge the book by its cover but check its competitive advantage over other big fish in the pond. Does Avast Secureline VPN Keep Logs? No…. Accordingly to the website itself we are a bit shaky regarding the speeds as they seem to be hypothetical. But after testing twice under the proper circumstances; the VPN is as fast as the website says. Actually, Avast Secureline VPN is among the fastest VPN providers when it comes to the speed. Also, Avast VPN security includes a military grade AES 256-bit encryption with a stronger hold and grip on its privacy and tunneling. Without AES encryption no matter how good the VPN provider is, the security will never be as firm as an AES encryption provides. Also, Secureline VPN License file 2018 works to secure DNS Leak protection by hiding all the occasional leak protecting users online activities from organizations trying to detect IPs. A VPN provider’s job is to establish a secure tunnel between the user and its connection online. That allows all the traffic to be encrypted so that no one can peek around. But the connection doesn’t provide the best encryption and leak protection leading to online vulnerabilities. Hypothetically speaking DNS or WebRTC leak is a common cause to your IP which reveals a your IP address. However, after careful examination, Avast Secureline VPN surpasses all the DNS leak rumors, and the connection can be said as leak free. Every user wants to engage in a VPN provider that supports multiple platforms and multiple connections while on the go, as its confusing and hefty to always sign in and out from one device to another. Avast Secureline support is far from impressive as it has a good compatibility ration with Windows XP, Vista, 8, 7, 10, Mac OS X all versions, Android and iOS. But sadly it fails to support any routers. That is where it just lacks. Furthermore, with a single created account users can connect up to 5 devices at the same time, whether you want to use it at home, or while on the go. With all pleasure comes excellent sorrow as well since this is among the few VPN providers that let you connect to 5 devices of the same name. If you are an iOS user then only either on an iPhone, iPod, iPad, etc. A strong VPNs customer base includes having an excellent customer support for all those users who seek aid and assistance with specific issues. This Avast Secureline VPN review got a hold of the company’s policies where it includes a support section on the website which has handy information for both experienced and beginner users. Majority of the queries have already been answered making it easier to resort to a solution. Keeping that apart the Avast Secureline license has a 24/7 call support at the user’s disposal. If that doesn’t help users can always divert to an email billing program for wide technical support via the ticketing system. The respondents are quick to reply with a detailed answer within 24 hours. Chat facility among other VPNs isn’t something new. What makes Avast Secureline chat different? We wanted to see if when called on the helpline, would it be an automated response? Avast Secureline VPN has its own ticketing system users will get an immediate response from the desired respondent. After dialing, a computerized response asks for your desired query then directs the call for a live call. Now users don’t have to wait and listen to annoying automated responses. What Are The Avast Secureline VPN Price Plans? If you are an iOS or Android user, the amount may be different costing $2.99 for 1-year subscription which on odd days cost $19.99. It’s critical not to confuse these plans as they are depend on the number of devices. With a free 7-day trial with no strings attached; you’ve 7 days to decide whether to buy it or not. You’ll be surprised to know even after a 7-day trial Avast Secureline offers a standard 30-day money-back guarantee if purchased through their ‘online retail stores’ or on Google Play by Android. Wait, there’s a twist!! If you upload or downloads over 10Gb of data, or the connection exceeds 100 times, then you won’t be allowed to make a refund later on. NOTE: Users can chose between PayPal, wire transfers or credit cards but the company does not provide payment access through bitcoins or crypto currencies which is surely a bummer.